Generally when asked the question, “How much money would you like to raise at this event?” most hosts realize that they haven’t given it enough thought. Having a realistic goal of how much money you would like to raise is the key starting point. It should determine the price of your entrance fee and the limit of your expenses. Obviously the key is to maximize your revenue and minimize your expenses. As fundamental as this concept is, most organizations disregard it when running one of these events. 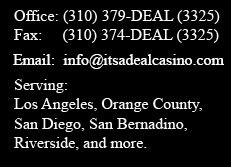 Find at least one table sponsor for each casino table being used and the sponsored amount should generally be at least $100. Encourage your sponsors to provide “gag” gifts that promote their business to be distributed at “their” table. Make your sponsors feel as though they are getting value for their donation and not only are they more likely to attend the event, getting a similar sponsorship the next year will be much easier. 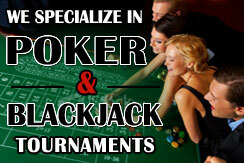 Bottom Line: Table sponsorship should cover at least the entire rental cost of the casino equipment and staff. This will vary depending on the “upscale ness” of your event. Ticket prices and what people are getting for their money will generally determine whether guest’s drinks are included in the ticket price or if they need to pay for them. Typically, the more expensive the entrance fees the less likely you are to charge additional for drinks. On “drink inclusive” events a limited bar (beer, wine, soda) is suggested to curb costs. On other events entrance fee usually includes two “drinks tickets” which are typically redeemed at a rate of one ticket for a soft drink and two tickets for wine or beer. Additional drinks require the purchase of more drink tickets. As part of their entrance fee guests are usually given an initial “stake” of chips or funny money. If they lose this initial stake they should have the option of acquiring more money for a token “donation.” This is an additional source of revenue though generally not to the extent that hosts expect it to be. Primarily because guest, for the most part, gamble conservatively. You want to give your guests a sense of having received value for their entrance ticket so be sure to include enough script money in their package. I suggest a minimum amount of $100 to $200 in script. Anything less and guest might feel a little “short changed.” Much more than this and you greatly reduce the likelihood of many people purchasing more script. Regarding the purchase of additional script: Make the additional “donation” an amount that is a round number and covered by a single bill ($5, $10, $20,$50 etc.). Often balloons and streamers or ribbon will suffice when decorating the event facility. Always weigh up the cost of any props you are considering using. People are typically not at your event for the decorations. Solicit donations if possible however, prioritize a table sponsorship donation ahead of a prop donation almost every time. you only have to pay for the beverages you have sold. especially if you are not being charged for the venue. organizations. Be aware of this possible cost when selecting a location. By selling the proposed number of tickets and following the guidelines above you will always realize at-least your intended net profit and in most cases a higher amount. However, if you don’t sell your intended number of tickets or if your expenses are higher than budgeted; your net profit is adversely affected in both cases.